Soichi, though, works not as a limo driver like Lloyd but as the lead singer in a death-metal band, Detroit Metal City, who have a best-selling CD on the shelves and a small legion of maniacal fans. He is, in other words, a rock god. So what’s wrong with this guy, who has a typical teenage boy’s dream job? 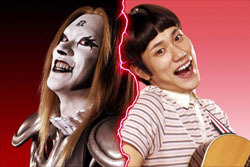 Based on Kiminori Wakasugi’s eponymous hit manga, “Detroit Metal City” begins with the joke of the wimpy Soichi forced into a musical persona he hates but happens to be good at. And that is really the only joke it has, which may not be fatal for a comic (“DMC” has sold 2.5 million copies in paperback collections) but presents a problem for director Toshio Lee and scriptwriter Mika Omori. By all rights, then, “DMC” should be a goofball comedy. Instead it is a pop musical whose fictional band is presented as the real death-metal deal. There is even a real DMC CD, released under the movie’s fake Death Records label. In Hollywood script terms, the film is thus hopelessly schizo. In Japanese pop world terms, however, it makes satirical sense. Many Japanese pop acts are employees of a talent agency or label, with managers and producers controlling their every move. They often don’t write their own songs — or even particularly want to sing them. An aspiring pop star from rural Oita Prefecture who dreams of debuting with a sappy number called “Raspberry Kiss,” Soichi walks into the office of Death Records soon after the film begins and is promptly signed by its terrifying female president (Yasuko Matsuyuki). She puts out cigarettes on her tongue and soon has Soichi under her thumb. The next time we see him, he is in white face and black leather, growling threateningly to a roaring crowd as his two band mates provide a menacing backup on guitar and drums. In the real world, a Soichi is more likely to make it big with “Raspberry Kiss” or its equivalent than with death metal, a subgenre heavy on Satanism, the entire Japanese fan base of which could probably fit into one of the film’s clubs. Meanwhile, Soichi (stage name: Johannes Krauser II) is head over heels for Yuri Aikawa (Rosa Kato), a former college classmate and fellow fan of what Soichi describes as “fashionable pop songs.” Aikawa-san, as Sochi calls her, is almost inhumanely nice, cute and oblivious to Sochiki’s utter unfashionableness. Even when he busks “Raspberry Kiss” on a lonely corner to an inquisitive poodle, her encouraging smile never fades. But does she think of him as anything but a pal? The unwelcome answer arrives when Soichi spots her with a smarmy but unquestionably fashionable producer whose main “production” seems to be his own ego. Soichi could reveal himself as the fabulous Johannes and squelch the jerk, but he is afraid of offending his pure, sensitive inamorata. Then he learns that the king of death metal, Jack Il Dark (Kiss lead vocalist Gene Simmons), is coming to Japan on his world farewell tour and wants to play with DMC. The PR from this pairing could boost DMC into the showbiz stratosphere. But Soichi fears it could also scotch his dream of making it with his “real” music and finding bliss with Aikawa-san. 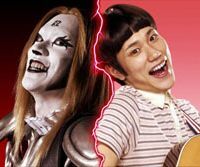 Fresh from his triumph as L, the sweets-loving genius detective in the “Death Note” films, Kenichi Matsuyama plays the similarly strange Soichi with more manga-esque gyrating and mugging, but vintage Jim Carrey — that human laugh machine — he is not. Rosa Kato is pitch perfect as Aikawa-san, signaling her interest in Soichi with a sweet, maddening ambiguity. “DMC” itself, though, is about as nuanced as a screaming Johannes vocal. I enjoyed watching its metalheads mosh it up, though. Their favorite band may be a Kiss ripoff, but they make the music, if not the inane movie, look like good, evil fun.